Life by the Creek: You Capture - My Choice! 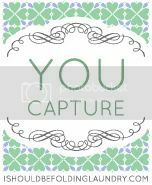 You Capture - My Choice! My baby girl in her Sunday dress. This parsnip came out of our garden. I thought it was hilarious. :D And tasty. Well, that's some of the best shots from this week. OK that parsnip is great! Oh and you can send some apple butter my way! love the shots - especially the apple picking one. Your daughter is beautiful...the parsnip - never seen one of those, and I'm now hungry. Wow, that is some parsnip! 1. Hannah is a doll. 2. Now I regret not getting any parsnips planted this year. 3. I'm looking forward to our apple trees being that large and productive someday! She is so precious! Love the apple butter. Looks delicious. Talk about the little parsnip that could! 1. I KNEW we'd be seeing pic of precious lil' dolly. 3. LOVE LOVE the apple tree shot. I can see that in a vintage edit...and the kids looking back at it one day... VERY VERY cool. The big tree + the kids+ the ladder= A Classic! Hannah is A. DOR. A. BLE. So she is. I think you should edit out the neighbour's house, too... just have her sitting there with nothing but grass, trees and sky behind her. Try it! Great pic, all of them.